Benes, J. (Jaromir), Freedman, C, Kumhof, M. (Michael), Laxton, D. (Douglas), Muir, D. (Dirk), Mursula, S. (Susanna), & Wang, H. (Hou). (2015). The benefits of international policy coordination reconsidered: Some important lessons from the global financial crisis. 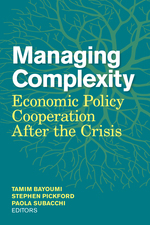 In Managing Complexity: Economic Policy Cooperation After the Crisis (pp. 77–110).